After watching Vegucated on a whim with my flatmate, I realised that how I was living and what I was eating wasn’t right, at least for me. I’d thought about going veggie for a while, and had never been a huge meat lover, but something clicked and I decided to try to go vegan. I found snacks the hardest. Breakfast was pretty straight forward, and while other meals were challenging to sort out in the beginning, I found it difficult to pick something healthy to snack on that didn’t contain any animal products. So… Here are my top ideas for healthy snacks, especially if you have recently become vegan. The most simple of all snacks! Pop a banana in your bag on the way out of the house, or make yourself a little fruit salad with soy yoghurt and granola if you’re feeling fancy! For a snack that will keep you fuller for a bit longer, try mixing fruit with some nut butter- banana and PB is a classic, but you could also dabble with lesser known nut butters… How about cashew butter? Almond butter? Brazil nut butter? I strongly believe hummus is a life-saver for vegans! – a can of chick peas with a few spoons of the water it came in, depending on how thick you want it. Then just blend it all up! So simple and quick. Plus, you’re getting good protein, carbs and fibre from the chickpeas, as well as calcium and good fats from the tahini. Yum! I would encourage you to just taste it and see what it needs. If you like it tangier, add lemon. If you like it creamier, add tahini, but be careful because it has quite a strong taste. Garlic seems to get stronger the longer its left in the hummus so leave it for a while before adding a ton more, unless you like that raw garlic burn! If you’re feeling creative, try mixing up the flavours… How about coriander and avocado? Roasted red pepper? Moroccan spiced? Try adding hemp seeds too for extra protein! 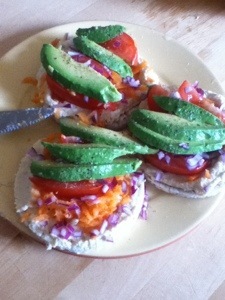 Hummus on rice crackers with red onion, avocado and grated carrot. Remember you can always change up the nuts and put maybe cashews instead of almonds, or add some extra dried fruit/protein powder/etc, just play around with that basic recipe until you have something you love! To make a version of the ‘Nakd’ bars, try blending 1.5 cups of cashews you have what is basically ‘cashew meal’ (i.e. tiny chunks of cashews) and then add a cup of (medjoul) dates one by one until you have a sticky dough-like texture. You could add some maca & cacao powder, or just some vanilla extract for a ‘cookie dough’ type bar. Press down into a baking tray, leave in the fridge for about half an hour and then cut up into bars, wrap them up and bam- they’re ready for you to grab whenever you need to! I always like to have frozen bananas ready for smoothies as they add a cold creaminess to them that I LOVE! For a creamier smoothie try just coconut milk and bananas (optional coconut water too… yum! 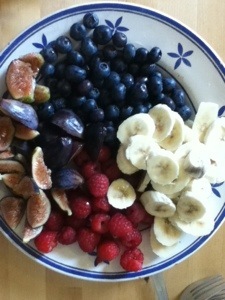 ), add some greens if you’d like, but of course you could just make any kind of smoothie. Adding chia/flax seeds and/or protein powder will help keep you fuller for a bit longer, or even a bit of nut butter. Deeeelicious! Pour into a big to-go cup and take with you for a quick snack on the go. Hope you guys found this a bit useful, feel free to comment below with more ideas that you have for quick and healthy snacks! 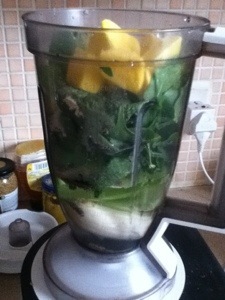 Green smoothie with spinach, banana and mango.